Little did we know when blogging the above-quoted words last year that we would get another great excuse to plug Mr. Terkel's work so soon. 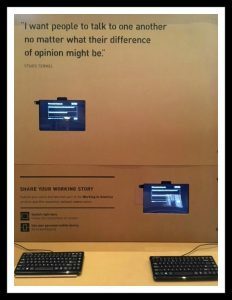 Central Library has been hosting a traveling exhibit of Working in America by Project& that is "[i]nspired by Studs Terkel's influential book, Working: People Talk About What They Do All Day and How They Feel About What They Do and profiles 24 people whose experiences represent the daily challenges and triumphs of the workforce." It will be up in the Great Hall until October 6, and if you haven't already, you should really make the trip to learn about and reflect on the people profiled, explore the information about working in St. Louis that the Library has compiled and arranged as a complement to the exhibit, and share information about your work at the interactive media station. In addition to "the book" itself, we were excited to discover Studs Terkel's Working - a Graphic Adaptation, a graphic retelling of several of the stories recounted in Terkel's original, as well as a musical based on Working with songs by James Taylor, Lin-Manuel Miranda, and more! All these were gathered together for a book display comprised entirely of works with the word "working" in their titles. 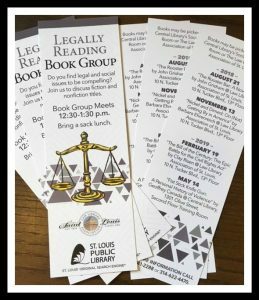 We will also use this opportunity to plug the newly launched book group, Legally Reading, a joint effort of St. Louis Public Library and the Law Library Association of St. Louis (a/k/a, the Civil Courts Law Library). We will be meeting quarterly over the lunch hour in either their beautiful space or ours, and the next book on our agenda is working-themed: we will be reading Barbara Ehrenreich's Nickel and Dimed: On (Not) Getting By in America and meeting to discuss it at the Law Library (13th floor of the Civil Courts Building) at 12:30 on November 13. Check out a copy from SLPL, and if you are at Central or in the Civil Courts building (jury duty? ), grab a book mark with our upcoming reads and other info. While hopefully you aren't working over Labor Day weekend (& note that SLPL will be closed on the day itself), hopefully we can all take some time to think about working and labor and all that they mean - how we benefit from others' work, how our work enriches our own lives, what (if anything) we might want to change about our work, how (& why) work has improved, and what working might look like in the future. 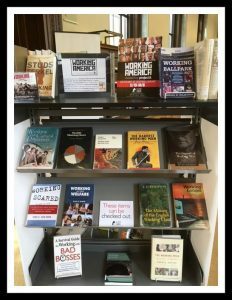 Of course the Library has lots of resources to assist with all such musings - pick up a book (or several) when you come downtown for the exhibit, or at any of our branches. If you are in the market for a job, we can help you there as well - SLPL is hosting a JOB FAIR on Saturday, September 15 at Central from 10 a.m.-3 p.m. with a growing list of participating employers (click the "JOB FAIR" link to learn more, or to find contact information if you'd like to participate as an employer) - so dust off your resume (we have books to help! ), dress for success & spend part of your Saturday downtown looking for your next great job. 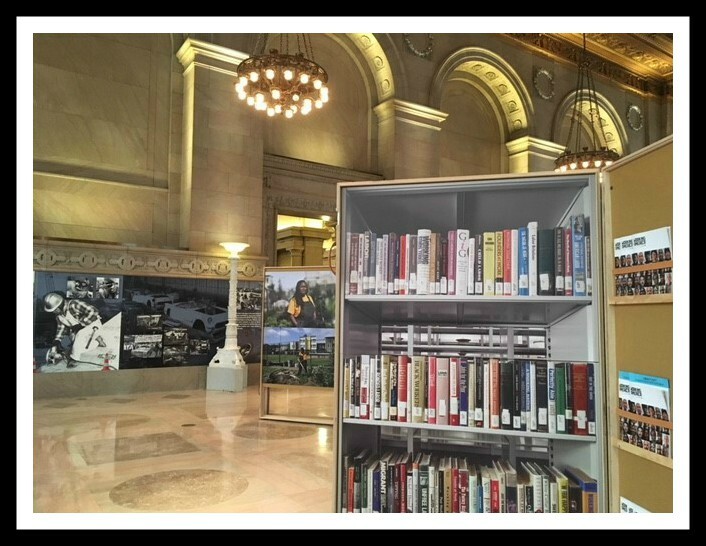 Project& invites you to share YOUR working story for posterity at these stations in the Great Hall.